After 1972’s Last House on the Left director Wes Craven didn’t make a horror film for five years, perhaps drained by filming the unrelentingly grim Last House and the controversy that followed it. 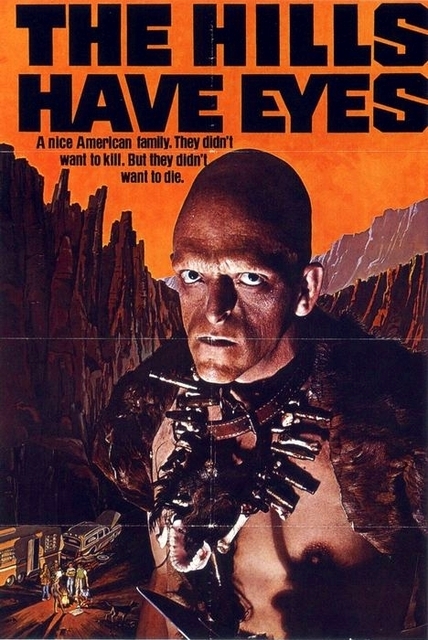 In 1977 he returned to the horror genre with The Hills Have Eyes. This, while still certainly grim in places, doesn’t reach the dizzy heights of depravity that Last House achieved, and is more re-watchable for it, in my opinion. The Carter family, led by Big Bob (Russ Grieve) and Ethel (Virginia Vincent) are heading to California with their family and two dogs in tow. To celebrate their silver wedding, they were gifted a silver mine by an Aunt and wish to visit it en route. Big Bob is a retired policeman of a take no nonsense sort of nature. Therefore, he of course ignores the warnings of the grizzled old Gas Station owner Fred (Robert Steadman) that the area is a no go area that is used by the government for air craft tests. They might of pay heed to his warnings of course, if he has just said ‘Seriously, don’t go that way, that way be a family of deranged cannibalistic madman’ but grizzled old Gas Station owners in horror films always go for the more mysterious approach. When their car inevitably crashes the Carters find themselves stuck in the desolate and unforgiving desert. Bob and his son in law, Doug (Martin Speer) venture out to find assistance while Ethel and the rest of the family Lynne (the always prolific Dee Wallace), Brenda (Suze Lanier) and Bobby (Robert Houston) and baby Katy stay behind. At first the family aren’t unduly worried about their predicament, but it isn’t long before the creeping terror that has been surrounding them makes itself known, in the manner of the aforementioned deranged cannibalistic madmen, who swarm their camp at night and start picking them off. From then on it is a fight for survival between the two factions, with the Carters having to become just as vicious as the hill folk in order to escape with their lives. Similar to the end of Last House on the Left, The Hills Have Eyes main theme is to show what depths ordinary white-bread American nuclear families can sink to when faced with their uncivilised counterparts. They become the very thing they despise, as cold, calculating and bloodthirsty as the evil hill folk they hold in contempt. This is shown in the very abrupt ending, which many people aren’t a fan of. I like it; it ends on the survivor’s realisation at what’s he’s done, and the very beginning of that shocking truth sinking in. It’s a bleak ending, and it fits as the end of a bleak film. The desert setting is used to great effect, and you can really feel the desolation and just how far from civilisation the Carter family are. It’s highly atmospheric and this is one film that I don’t think would benefit from a sparky HD clean up. The grainy film adds to the raw exploitation type feeling of the whole piece and is essential to the experience of the film for me. Wes Craven’s direction is tight, he uses his space and his cast wisely, and despite the film not being as gory as some might expect, is brutal and intense in its violence. The villains of the piece, led by the nefarious Jupiter (James Whitworth) are slightly cartoony in parts, as evidenced in the rather dense Pluto (genre favourite Michael Berryman), but they still manage to infuse a lot of menace into their roles, and while not as physically imposing as their mutated equivalents in the 2006 remake, they are clearly a lot more human, in most respects, which helps the theme of the film flow better. Craven has stated that he was influenced by Tobe Hooper’s The Texas Chain Saw Massacre while making this film and while The Hills Have Eyes may not be as visceral and heart pounding as that film it still among Craven’s best work and a rightful cult classic of the 1970s. This review was first published on the Scream Horror Magazine website and since then we have sadly lost the director of this film and many other classic horror fare, Wes Craven. Much has been said about this total gutter of a loss to the horror genre, by much better word smiths than me so I shall just say that I loved his work, I am very sad that he is gone and that I hope he sleeps well. He can leave the nightmares to us. This entry was posted in Uncategorized and tagged 1970s horror, 70s Exploitation, Horror, Horror Films, Michael Berryman, The Hills Have Eyes, Wes Craven by jelliclezombi. Bookmark the permalink.